Liverpool Hope University opened its Hope Park Campus to the public last weekend to become one of Childwall in Bloom’s “open gardens”. The annual event is now in its fifth year and was officially opened by the Deputy Lord Mayor. 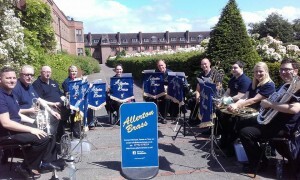 Allerton Brass’ 10-piece ensemble were on hand to provide some appropriate “mood music” for the event. They clearly worked their magic once again with the grey clouds giving way to glorious sunshine as the group delivered their rendition of the ELO classic “Mr Blue Sky”! 2016 is the Bi-Centennial of the completion of the Leeds-Liverpool Canal. To celebrate, The Inland Waterways Association designated The Eldonian Village Canal Festival which took place on 11/12 June as its 2016 National Campaign Festival. Allerton Brass were delighted to be invited to help open proceedings and despite somewhat inclement weather had a great time providing the “warm-up” for the various dignitaries to perform the official opening ceremony.